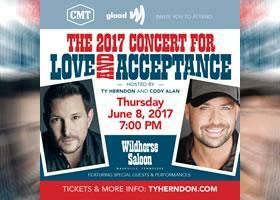 (Nashville, Tenn. – April 27, 2017) – Ty Herndon’s 2017 Concert For Love and Acceptance, hosted by Cody Alan, has added more talent to its already stellar lineup. In addition to Ty Herndon, Billy Gilman, Kree Harrison, Ryan Kinder, Runaway June, Lorrie Morgan, Michael Ray, Street Corner Symphony, and Thompson Square, the concert will also include performances by Trent Harmon, who gained national attention for winning the fifteenth and final season of American Idol, and Capital Nashville recording artist Mickey Guyton. In addition, critically acclaimed comedian Dana Goldberg is also set to appear, making her Nashville debut. The event, created to support at-risk youth, is set for Thursday, June 8 starting at 7 p.m. at Wildhorse Saloon in Nashville, Tenn. In 2015, the Concert for Love and Acceptance was voted one of the Top 10 events held during the CMA Music Festival week. For more information on Concert for Love and Acceptance or to purchase tickets, please visit www.TyHerndon.com. For media inquiries, contact publicity@aristomedia.com.